These are great activities for ESL students because they require hands-on work and allow students to learn by seeing, which is often easier than listening to science lectures for kids who don't speak English as a first language. This example of an ESL activity is fun and very understandable for 4th graders. The project is to measure the acidity or alkalinity of a substance. Students will use cabbage juice for their measurments. To make purple cabbage juice, cut one red cabbage into strips, place in a pot with just enough water to cover it, and boil for 30 minutes. Strain the juice into a container and cool. 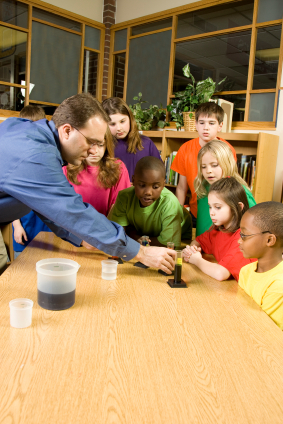 ESL activities can be done as a demonstration or a lab experiment. Label the containers and put a small amount of liquid in each. Using a dropper or spoon, place a small amount (a teaspoon or so) of cabbage juice into each. If the students are doing this themselves, remind them not to taste any of the liquids. Have the students record their results on a chart. Vinegar and lemon juice are acidic and should turn red. Baking soda and ammonia are alkaline and should turn green. Water will be purple like the cabbage juice, so it is neutral. The class could make another chart of these results. Fill both containers half full of water (same temperature). Wrap the paper around one tablet and gently crush it with the wood block or mallet. Put the crushed tablet into one container and time how long it takes to dissolve. Put a whole tablet into the other container and time it until it dissolves completely. By crushing the tablet, more surface area was exposed to the water. To increase the thrust of a rocket, you increase the surface area of the fuel. This is why liquid fuel is sprayed into the combustion chamber, and why a solid fuel has a core in the center. This is a good outside activity or an activity for a work area that won't be harmed when the bag of liquid explodes. Make sure the bag is airtight by putting some water in it, zipping it, and turning it upside down. Tear or cut a paper towel into a 5-inch square. Place 1½ tablespoons of baking soda in the center and fold the paper over it into thirds; in other words, fold one side over it (about a third of the paper), then the opposite side over that. Turn the folded paper and do the same; folding one side, in thirds over the middle and the opposite side over the middle. This is like a time-release packet. Pour into the bag ½ cup of vinegar and ¼ cup of warm water. The next step has to be done quickly. Zip the bag almost all the way shut, leaving just enough room to slip the packet inside, drop the packet, and quickly close the bag. Or, you could hold the packet inside the top while you close the bag. Shake it a little and stand back. The bag will puff up and pop open loudly. What had been demonstrated is the formation of carbon dioxide. It is a gas made, in this instance, from an acid reacting with a base. You could include a discussion about making bread, using yeast (which converts sugar to carbon dioxide) or a combination of baking soda and buttermilk (used in quick bread). "ESL Activities - 4th Grade." YourDictionary, n.d. Web. 22 April 2019. <https://esl.yourdictionary.com/lesson-plans/esl-activities-4th-grade.html>. Following are ESL activities for 4th graders and elementary classrooms. Areas covered are:Testing for acids and basesDemonstrating surface areaLearning about gasesThese are great activities for ESL students because they require hands-on work and allow students to learn by seeing, which is often easier than listening to science lectures for kids who don't speak English as a first language.